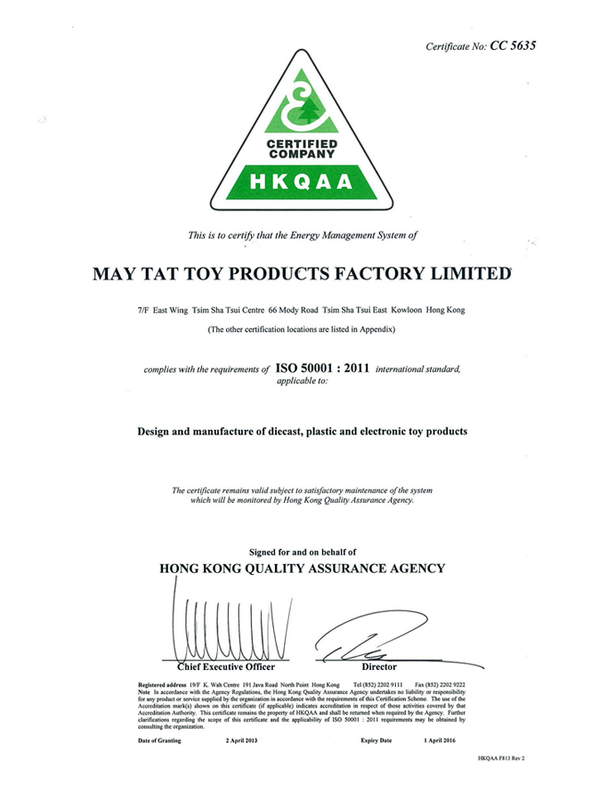 The May Cheong Group, through it’s manufacturing entity May Tat Toy Products Factory Limited, was recently awarded ISO50001:11 certification. The Group is well known throughout the world for their highly detailed line of die-cast vehicle replicas and radio control toys which they sell under the brands Maisto, Bburago, Muscle Machines, Polistil, and more. The certification is presented for the development and implementation of policies and procedures that will enable the company to use energy in a more efficient manner. The rigorous criteria necessary for achieving and implementing the requirements establishes May Cheong Group as one of the most sustainable and environmentally friendly toy manufacturers in the world. During the process of certification, the company realized that the energy management system was not just established to monitor usage. In reality, the system analyzed the usage and also used a scientific methodology for lowering the manufacturing costs by identifying where waste occurs and implementing steps towards improvement. The entire process also helped to motivate employees to becoming more innovative in their approach to energy management. The owners of May Cheong Group remain committed to improving the sustainability and environmental impact of their factories. They have recently stated their next goal of reducing carbon emissions and becoming Carbon Footprint certified. The MAY CHEONG GROUP is a collection of affiliated companies working together to create innovative toy and replica products. The Maisto brand name was registered in 1990 by May Cheong, a vertically integrated manufacturer based in Hong Kong. The company employs over 7,500 employees worldwide and maintains their own manufacturing facilities covering over 2,000,000 square feet. For more information, visit them at www.maisto.com, www.bburago.com, and follow them at https://www.facebook.com/BburagoCollezione, https://www.facebook.com/MaistoToys, and www.twitter.com/maistotoys.